~* West End Designs Journal *~: Blankets for all! As the Winter season approaches, things around here start to get all grey, brown and black. No more color. Admittedly, I am a neutral color person. I wear mostly black, sometimes browns and the occasional navy blue (and that is going out on limb). My house is mostly neutral, aside from my office which is deep red. It's not that I am boring, or I don't like colors, no not at all. I just find the neutral palettes more soothing and flattering, if it is clothing. Does anyone remember a lovely Donna Karan suit that Barbara Streisand wore during one of her few television interviews? Head to toe in cream wool. It was lovely, and flattering. Enough said. Well, during one of my blog lurking sessions aka early mornings at the computer, I stumbled across this blog......and then this one. (Go spend a few minutes, or hours, on these blogs, I am willing to bet you will find some great color inspiration!) Immediately I said "I must crochet". I must crochet now. And in bright colors no less. I love the items, fresh and fun. 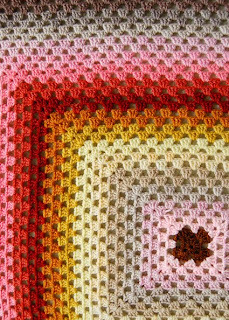 Whoever said granny squares are ugly and boring, look at this picture from one of my favorite blogs. Just lovely! Click picture and go to her pattern! I also love this picture of her blankets (and the dog is pretty darn cute too!) Now I'm off to find some brightly colored yarn and my hooks!